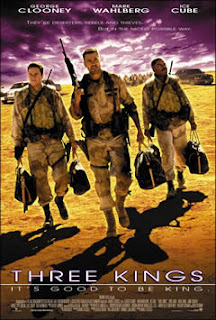 Tag line: "It's good to be kings"
Set in Iraq during the final days of the Gulf War, Three Kings is the story of four U.S. soldiers who happen upon a map showing them the whereabouts of a huge stash of gold, which the Iraqi army had stolen from Kuwait. Taking advantage of the cease-fire, Major Archie Gates (George Clooney) leads an unauthorized expedition, made up of Sgt. Troy Barlow (Mark Wahlberg), Chief Elgin (Ice Cube), and Pfc. Conrad Vig (Spike Jonze), to find it. Unfortunately, their trek into the desert isn't the grand adventure they'd hoped it would be. Though the conflict has all but ended by the time Three Kings gets underway, Gates and his crew still manage to find a few remnants of it in the form of Iraqi troops terrorizing a small town. By the terms of the cease-fire, Americans are permitted to come and go as they please anywhere in the country, and without fear of reprisal. But the same courtesy isn't extended to the ‘rebellious’ civilian population, who are being systematically rounded up and slaughtered by soldiers loyal to Saddam Hussein. As for the U.S. Military, its policy is to honor the terms of the cease-fire, which means they must keep out of Iraq’s internal affairs. Gates and the others do find the gold, but as they're loading it onto a truck, they witness first hand just how severely the Iraqi ‘uprising’ is being suppressed, and it’s too much to bear. During the war, these four saw very little combat. Now that it's over, they’re faced with a dilemma: do nothing, and permit the outright murder of men, women and children, or get involved, and risk open combat, with nobody around to back them up. The war has ended, but for these men, it might be starting up all over again. The basic premise of Three Kings, stealing a large sum of gold from the enemy during a time of war, was also the theme of Kelly’s Heroes, a 1970 film starring Clint Eastwood and Telly Savalas. Set in WWII, that movie featured a band of American soldiers after a secret cache of Nazi bullion, but where Kelly's Heroes was, first and foremost, a comedy, Three Kings has something more compelling to say about the effects of war, and time and again, puts its characters in harms way. If these men want the gold, they’re going to have to fight for it, and in the end, each one realizes they may be willing to fight for a whole lot more besides. Barl3y: Can't argue with anything you've said here. It's a fantastic piece of film making. I haven't seen the alternate ending, either. I'll have to try and find it! I love movies that move in and out of a real situation in history and develop a fictional plot element. Probably a movie, that although got some initial buzz at its release, needs to be seen again. Jim: Thanks for stopping by, and for the comment! Yeah, this film handles the balance of real vs. fiction quite nicely, and it has a great style to it as well. And I'll be sure to stop by and check out your Podcast! (everyone: copy and paste http://www.moviebrainrot.com into your browser to check it out). I'm in the minority but I just thought this film was okay. I liked the peak into the life of soldiers rarely seen (the partying and the football shooting- if I remember that right) but ultimately I just thought the situational humor struck too strange a balance. I would have preferred a more realistic film.